Our relationship with the ocean is undergoing a profound transformation. Just three decades ago nearly everything we ate from the sea was wild. Today rampant overfishing and an unprecedented biotech revolution have brought us to a point where wild and farmed fish occupy equal parts of a complex and confusing marketplace. We stand at the edge of a cataclysm; there is a distinct possibility that our children's children will never eat a wild fish that has swum freely in the sea. 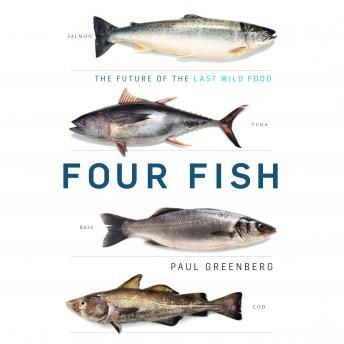 In Four Fish, award-winning writer and lifelong fisherman Paul Greenberg takes us on a culinary journey, exploring the history of the fish that dominate our menus - salmon, sea bass, cod, and tuna - and investigating where each stands at this critical moment in time. He visits Norwegian megafarms that use genetic techniques once pioneered on sheep to grow millions of pounds of salmon a year. He travels to the ancestral river of the Yupik Eskimos to see the only Fair Trade-certified fishing company in the world. He makes clear how PCBs and mercury find their way into seafood; discovers how Mediterranean sea bass went global; challenges the author of Cod to taste the difference between a farmed and a wild cod; and almost sinks to the bottom of the South Pacific while searching for an alternative to endangered bluefin tuna. Fish, Greenberg reveals, are the last truly wild food - for now. By examining the forces that get fish to our dinner tables, he shows how we can start to heal the oceans and fight for a world where healthy and sustainable seafood is the rule rather than the exception.